The Lakers Just Ended Practice With A "1, 2, 3, Championship!" Cheer. This Does Not Mean The Lakers Will Win The Championship. The Los Angeles Lakers just sent out a tweet of their team breaking from the huddle after cheering "1, 2, 3 championship!" Laker fans are retweeting the hell out of it. Avid and casual basketball fans alike should be heartened by this intrepid display in spite of long odds, and also sad. Unlike years past, the Lakers wanting to win the NBA championship this year does not mean the Lakers will win the NBA championship. It's that time of the year. The Lakers are above .500, 32-31, for the first time in over three months. They're a half-game out of the eighth seed in the Western Conference, and three out of the sixth. Sometimes-sober Mamba has averaged 36 points, 7 rebounds, and 7 assists over the last two weeks, and has recorded at least 41 points and 12 assists in back-to-back games. He's cursing in every interview. He's doing that thing with his jaw. ESPN is writing aspirational pro-Laker headlines. Sad Dwight Howard is playing like happy Dwight Howard. It is likely that none of these facts matter. The Lakers might make the playoffs. The Lakers might even go as high as the sixth seed, because hypotheticals. But the Lakers will almost definitely not win the NBA Championship. 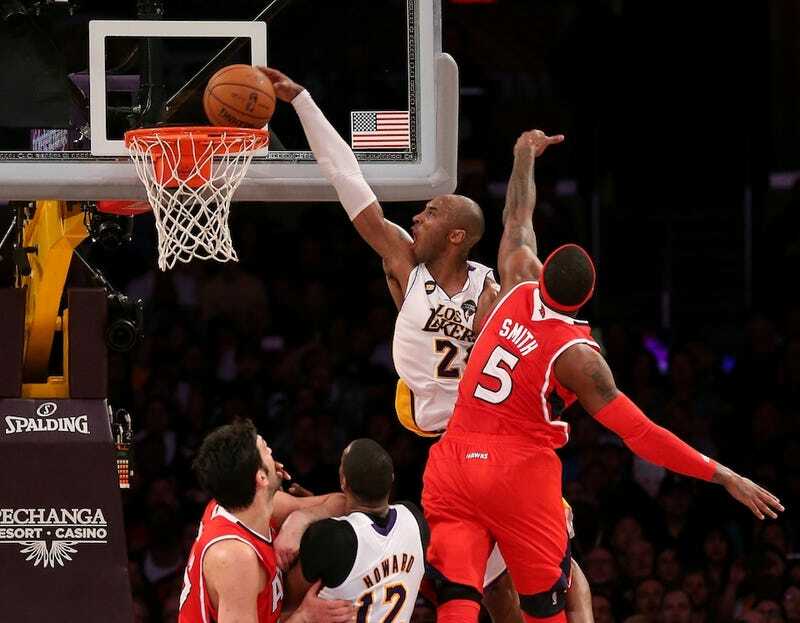 Kobe Bryant looks like Oscar Robertson or Michael Jordan or LeBron James. We're afraid to say he won't keep this up, because he's excessively competitive and determined and good at basketball, although this doesn't feel sustainable unless you are Oscar Robertson or Michael Jordan or LeBron James. At some point, if the Lakers make the playoffs, they will have to pit Steves Nash and Blake against Russell Westbrook or Tony Parker or Chris Paul or Michael Conley or Ty Lawson or Steph Curry or Jeremy Lin. The Lakers have not beaten a Western Conference opponent with a winning record since January. Earl Clark. This concludes today's Lakers update.